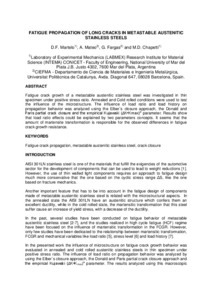 Martelo, D.; Mateo, A.; Fargas, G.; Chapetti, M.
Fatigue crack growth of a metastable austenitic stainless steel was investigated in thin specimen under positive stress ratio. Annealed and Co l d rolled conditions were used to test the influence of the microstructure. The influence of load ratio and load history on propagation behavior was analyzed using the Elber`s closure approach, the Donald and Paris partial crack closure and the empirical Kujawski (∆K•Kmax) α parameter. Results show that load ratio effects could be explained by two parameters concepts . It see ms that the amount of martensite transformation is responsible for the observed differences in fatigue crack growth resistance. Martelo, D. [et al.]. Fatigue propagation of long cracks in metastable austenitic stainless steels. A: International conference on Low cycle fatigue. "seventh int conf Low Cycle Fatigue". Aachen: 2013, p. 425-430.